Celebrating Life recently hosted a festival at Jahangirnagar University. The day after Pohela Boishakh, for two days there were movie screenings, a photo exhibition and a memorable performance by the legendary Bangladesh rock band “Feedback”. The event was a success in many ways but mostly because it proved to be a great way to motivate students to participate in the contest. The days after the Pohela Boishakh celebration were hot and humid. The same cannot be said about the environment of Jahangirnagar University­­ – it was quite and calm. The feeling of holiday and end of semester was looming large at the campus. A feeling of retire after celebrating Bangla New Year and preparation for the exams made the huge campus feel emptier than ever. Yet, far from the hustle and bustle of Dhaka, Jahangirnagar University was the perfect setting for another Celebrating Life tour. It was the first time this year that a “Celebrating Life” event was held for two consecutive days on the 15th and 16th of April. The tour was held with its regular attractions of photo exhibition, movie screening and a concert. This time, renowned rock band “Feedback” performed. Because of the two day-long program, the event, for the first time, had the chance to screen all the movies several times over. Standard Chartered's Head of Corporate Affairs Bitopi Das Chowdhury and Star Insight's Editor-in-charge, also Celebrating Life's Festival Director Rafi Hossain were present at the occasion. The film screening and photo exhibition started at 12:00pm on 15th April in Jahangirnagar TSC auditorium. The heat and exams made the event start slow. After classes and exams many students came to the auditorium building and with inquisitive eyes wandering around the corridor looking at the exhibited photographs. The photographs again stole many hearts and encouraged many to send entries for the 2012 contest. The proof of the encouragement was evident the next week when we found ourselves flooded with photography entries from Jahangirnagar University students. There were also many who had registered online for lyrics and films the same week. The pouring number of new entries validated the tours outside the capital and encouraged us to organize many more events like this in weeks to come. It is true that, like previous two events the auditorium was not packed with viewers. The continuous screening for convenience of the students, the summer heat and the exams produced scattered viewers who showed up at times convenient for them. The photo exhibition and film screening went on all the same time. After watching the photographs many of them peeked through the doors of screening hall to find the dark room lit with sound and picture. The ones who went in to watch the movies were not disappointed. They were glued to their seats and didn't leave until the very last frame had been displayed. The movies produced by selected young participants of the “Film Making Workshops 2011” were intelligent, thought provoking and at times mind boggling. They were astonished by the storylines and the quality of deliverance. After each screening, viewers came up to the organizers asking about the movies and their directors. They were amazed to learn that the directors were new in the industry. Many were asking about how get involved in the workshop in 2012. Humaira Bilkis, one of the directors of the movies, was present to see the reaction of the audience on her film. 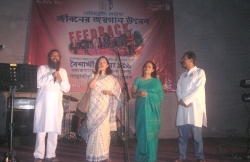 Before the concert, Bitopi Das Chowdhury and Rafi Hossain delivered a brief speech onstage. Jahangirnagar University TSC Assistant Director Nasrin Sultana and Deputy Director Ashraf Uddin Ahmed joined them. Bitopi Das, in her brief speech appreciated the enthusiasm showed by the students of the University. She didn't forget to mention how she was enjoying the performance with the students. Participation of youth is what keeps contests like “Celebrating Life” going on every year. It is the youth of the nation that need proper grooming for a better future. Celebrating Life, in many ways is a tool that grooms the young creative minds. 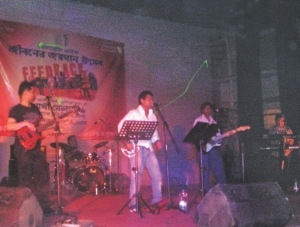 Feedback is one of the leading rock bands in Bangladesh and is considered to be pioneer in Bangla Rock music. Therefore, we had a certain expectation from both the band and the audience. With the scattered audience from the movie screening the concert started at 6pm. Suddenly it felt like through the hot and humid air the news of Feedback performing spread like wildfire. Within minutes of their performance, the auditorium filled with music enthusiasts. The hot auditorium got even hotter as students and even outsiders joined the fun. As the concert progressed, fans started dancing with the tantalizing music from the legends of the genre. Some took their shirts off danced through the whole performance. Drenched by the music some danced their way on the stage. The Concert entered its second and last phase. The crowd got more animated as Feedback started playing their more popular songs. At that point there was not a single inch left in the auditorium for another person. Realizing that they had little time left, they played their most famous song “Melai Jaire.” The heat among the audience and the auditorium went through the roof as the tune of the super-hit song was playing. Containing the crowd became difficult as if they were in trance. Unfortunately for both us and the crowd, it was the last song from the band. The fans wanted more. But Feedback couldn't linger. We felt, we were firsthand witnesses of the spirit of the youth of Bangladesh. Public universities in Bangladesh like Jahangirnagar are large. They have students from all over the country with a diverse taste in music and art. Standard Chartered and The Daily Star, therefore, want more participation from students of these universities. The tours enable us to create motivation amongst the youths. The instant increase in number of entries from Jahangirnagar University proves the effectiveness of the process. Celebrating Life is not just an event that gives prizes and host concerts, it is an effective platform that allows the mobilization of the young creative minds of the nation from where they can go further ahead. Late filmmaker Tareque Masud called it “a meaningful contest”. It not only has a monetary value but also brings respect and recognition. Therefore, we find many participating even after not winning for the last four years. Celebrating Life 2012 is hosting another contest this year with the theme “Celebrating the Youth of Bangladesh”. For information on how to participate, please visit www.celebratinglifebd.com.